The type of treatment you and your dermatologist decide to try depends on condition your skin, how long you’ve had your stretch marks, willingness to have multiple treatments. Some of the most effective treatments are: Laser or light therapy, Microneedling and Retinoids. Make an appointment in Dermatology clinic in NYC today to experience highly personalized and comprehensive New York dermatology care. Get the treatments you need in the safe, reassuring hands of the best in class dermatologist in NYC. When your skin gets stretched beyond its normal limits, you may develop stretch marks, also known as striae. Though they may seem unsightly, stretch marks are not medically harmful and they don’t result in any pain. 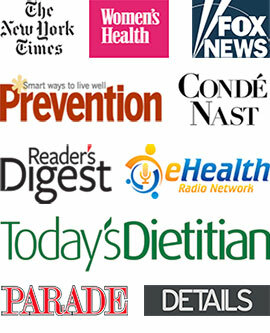 They most commonly appear on your abdomen, buttocks, hips and breasts. The indented streaks across your skin will fade eventually, although not as quickly as you may hope. And even with treatment, stretch marks can’t completely be removed. Instead, most of the dermatology or cosmetic treatments for stretch marks done by your NYC dermatologist only reduce the severity of their appearance. 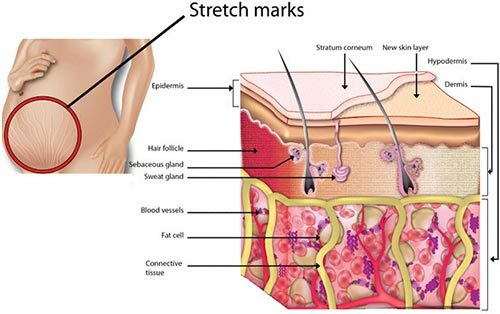 Again, stretch marks are caused by fat gain that causes your skin to stretch. Pregnant women are almost all at risk for developing stretch marks. But your skin is made to handle the excess stretching to accommodate your baby; even though you may not be thrilled with the look. Cortisone weakens skin tissue. So when you either add the hormone to your body or develop excessive amounts, your skin becomes more at risk for getting deep stretch marks. The skin around your stretch marks may feel slightly different too rougher and more jagged. For the most part, when a weight gain is short-lived, such as when you’re pregnant or quickly built up your body for a competition, the stretch marks eventually fade so that you can barely see them. Sunless tanning creams sometimes may be helpful to cover up the marks if you are self-conscious and they’re in a spot on your body that’s visible, such as on your thighs when you wear shorts in the summer. Tanning booths or any kind of UV tanning won’t make your stretch marks disappear. In fact, tanning often makes them more distinct because the striae don’t tan to the same degree as the rest of your skin. Your best option, before making an appointment with your New York dermatologist, is to just cover them up with longer shorts and cover-ups on the beach. While you may find a plethora of so-called a “miracle stretch mark removers” online or over the counter in the drug stores, for the most part, they don’t work and won’t help reduce the appearance of stretch marks. When you get tired of looking at your stretch marks or if over time, they don’t seem to be fading to your satisfaction your NYC dermatologist can help. Before beginning any kind of treatment, your dermatologist may check your bloodwork, especially if there isn’t any other, definitive reason for your stretch marks. Test results, combined with a medical history, should allow your doctor to proceed with various options to rid you of the unsightly lines. 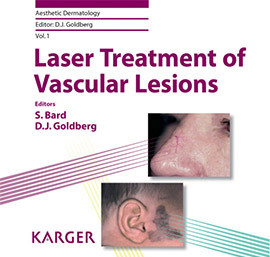 Laser or light therapy: The technologies behind various laser and light therapy treatments is based on the process of collagen and elastin stimulation provided by the impulses. While these treatments are painless and take only minutes to do in your doctor’s office, you may have to return for multiple treatments before you see any results. Microneedling: Cosmetologists may offer this service, but to reduce your risk of infection and poor delivery, you should rely on an experienced dermatologist in New York to perform this procedure. It’s designed to create micro-trauma in the skin and boost collagen production to replace the skin with healthier, new tissue. Retinoids: Creams and lotions that contain retinoids derivatives of Vitamin A work best on stretch marks that are no older than just a couple months. Tretinoin is one of the most commonly used retinoids, and you simply rub it on your skin. The cream is designed to also promote collagen production, which should result in changes in your skin’s appearance. Don’t try any over-the-counter or retinoid-based stretch mark removers while you’re pregnant. Side effects may harm your fetus. Talk to your dermatologist in NYC about other options that are safe for both you and your baby. Do you have any questions about Stretch Marks? Would you like to schedule an appointment with an internationally recognized, award winning dermatologist in Midtown NYC, Dr. Susan Bard of Manhattan Dermatology? Please contact our Midtown or Upper East Side NYC clinic for consultation with cosmetic and laser dermatologist.